A £20 note featuring economist Adam Smith will be issued on 13 March, the Bank of England has said. The note will also include a number of new security features designed to tackle counterfeiting. While the Bank has yet to reveal the safety measures, they are thought to include a see through feature and a holographic strip. 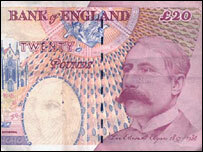 The current £20 note, which features composer Edward Elgar, will be phased out after the launch of the Adams note. "The introduction of the Adam Smith £20 from 13 March will be a major undertaking for us as the £20 denomination is by far the most common note in circulation," said Andrew Bailey, the Bank's executive director for banking and chief cashier. "This means that the proportion of Adam Smith £20s will gradually increase over time. "The note's enhanced security features will play a key role in our continuing fight to prevent counterfeiting. Maintaining public confidence in our banknotes is paramount." Bank governor Mervyn King announced in October last year that he had chosen Smith to replace Elgar on the £20 note. The decision is an historic one because the philosopher and economist will become the first Scotsman to appear on a Bank of England note. He is already featured on a Scottish £50 note. Smith was born in Kirkcaldy, Fife - part of Chancellor Gordon Brown's constituency. The economist is most famous for his book the Wealth of Nations, which many regard as almost inventing the concept of competition and market forces.